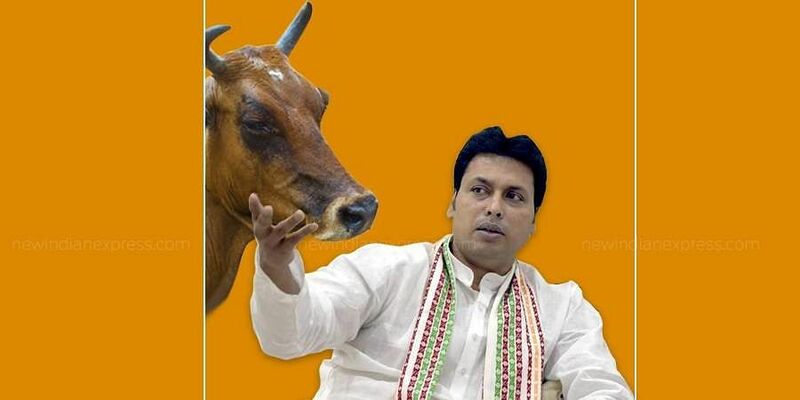 "One has to invest Rs 10,000 crores for employing 2000 people but if I give 10,000 cows to 5000 families they'll start earning in 6 months," Tripura CM Biplab Kumar Deb said. Tripura Chief Minister Biplab Kumar Deb has come up with a new plan -- cow rearing -- to generate employment in the state and fight malnutrition. The CM said he would launch a scheme to distribute cows to 5,000 families which in turn would help them to earn money in six months. "I'm not against setting big industries but in that one has to invest Rs 10,000 crores for employing 2000 people but if I give 10,000 cows to 5000 families they'll start earning in 6 months," Biplab was quoted as saying by ANI. In his latest statement, he announced that he himself will start a cow farm too at his residence and milch cows along with his family and consume its milk. Biplab further said that his family will lead the example for people of Tripura to domesticate cows and it will help the state to fight malnutrition. This is not the first time Biplab made such claims. The Tripura CM, who is known for his controversial statements, had earlier said that graduates should rear cows and milk them or set up a pan shop instead of running behind netas for government jobs. "If they had set up pan shops instead of running after political parties and wasting their time, they would have had a bank balance of Rs 5 lakh by now,” he had said. He even had a suggestion for mechanical and civil engineers. “Mechanical engineers should not go for civil service, the civil engineers should. Civil engineers can pinpoint faults in the construction of a building. If a person has got the experience of civil engineering, s/he can build up people who are in the administration. Civil engineers are the ones who have got the knowledge to build up a society,” Biplab had said.